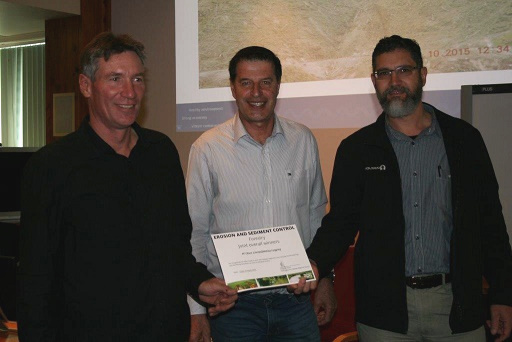 PF Olsen and logging contractor, McKay & Olsen Ltd, Taupo have recently been awarded “joint winners” of the 2016 Erosion and Sediment Control Award for Forestry from Waikato Regional Council (WRC). Mike McKay and his crew were contracted by PF Olsen to cable harvest a particularly challenging Soil Conservation Area (13.1ha, 10,2000t) near Taupo. The care taken with extracting logs off the steep slope and across the Pakuri Stream and chasm in this block was commendable. 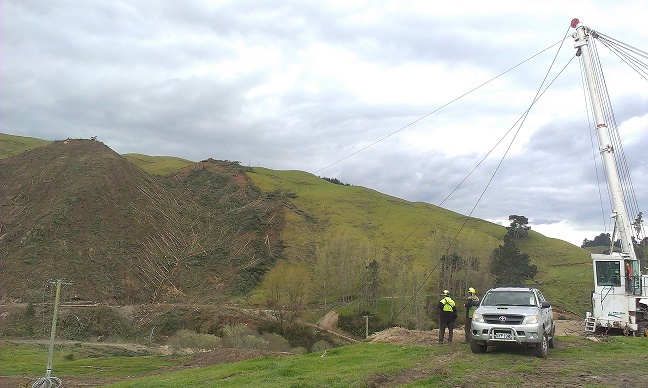 Soil disturbance of a severe erosion risk ephemeral watercourse was minimised through a proactive and collaborative relationship amongst PF Olsen, the contractor and the Waikato Regional Council (WRC). Following on-site discussions, the decision was made to relocate a hauler pad to a higher site which would significantly reduce the potential for logs to be dragged down thorough the watercourse, minimising disturbance. The pad relocation involved the temporary removal of powerlines for several weeks and sourcing a generator to supply power to the pump shed for the farm water supply. The excellent working relationship that Josh Penn had initially established with the forest owner and his harvest planning, the professionalism and skill of Mike and his team during the harvest and the work that Kim Evison did regarding the costing for and planned re-establishment of the enlarged forest area all contribute to this outcome. These annual awards cover small, medium and large scale civil earthworks, forestry and environmental innovation. The forestry award this year is shared with Hancock Forest Management. “It’s a fantastic outcome and shows how much effort the forestry industry, working with the council, has put into lifting performance in recent years,” said WRC land development team leader Jorge Rodriguez, “Best practice in erosion and sediment control is now the norm on a large number of earthworks sites, both big and small. All award winners and nominees have made a fantastic effort to exceed compliance expectations in implementing best practice erosion and sediment controls for earthworks”. Mike McKay (left) from McKay & Olsen Ltd, Craig Fisher (right), PF Olsen Ltd with Vince Udy from the Waikato Regional Council.